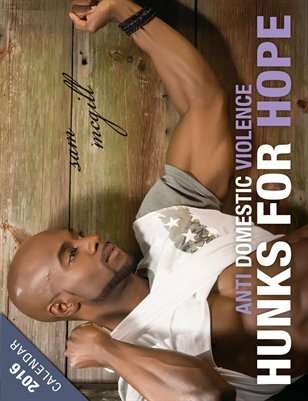 Its here, the 3rd Annual Hunks4Hope Calendar! Twelve months of well-oiled chiseled chests and the curves of the male body? Yes Please! A portion of the sales of the calendar will be donated to two well-known domestic violence grassroots organizations; Casa Esperanza Para Mujeres Y Ninos (House of Hope for Women and Children) and Milagros Day Worldwide. Hunks4Hope, is an organization that partners with models, photographers and a slew of other talented contributors, uniting with one common goal, help and awareness and features some of the most caring and beautiful men in the United States. Proceeds from the calendar help domestic violence victims make the transition from dire situations to a position of hope and possibility. Not only are the men featured in the calendar easy on the eyes, but they are passionate about the cause that they are taking it all off for.